A few days ago I featured a little The Body Shop haul all of which was based around eye care. I am a woman obsessed with ageing, particularly my eye area. 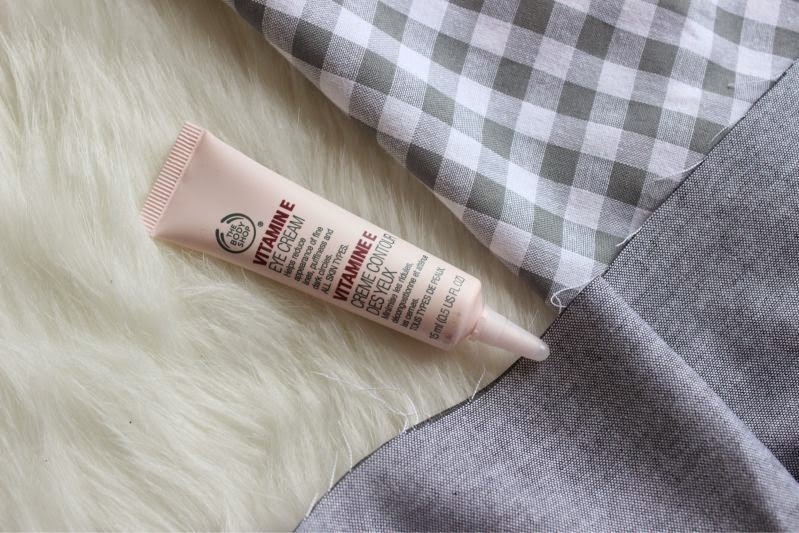 I mentioned in such post that I was no stranger to the The Body Shop Vitamin E Eye Cream but had somewhat neglected the formulation within the last year or so, I was keen to see if the formulation had changed. The good news is no and the even better news is that I have fallen in love with this eye cream all over again. If thick eye creams are not something you enjoy or perhaps need I would urge you to try out The Body Shop's Vitamin E Eye Cream as it is super light weight but gently nourishes the under eye area. The great thing about it is the texture is not greasy in the slightest so you can apply make-up over the top without it creasing or caking. It moisturises, de-puffs the skin and cools in one quick step. I like to keep a tube on my desk for when I'm working on the computer and one in my bathroom for morning use (if this contained SPF it would be my dream eye cream). I know this is slightly gross (okay a lot) but sometimes I wake up in the morning with eye cream crust. Not sleep but eye cream that hasn't sunk into my skin. Glorious I know but you will be happy to know that The Body Shop's Vitamin E Eye Cream doesn't do this. It fully sinks into my skin regardless of what time of day I apply it. I will be truthful and say that I don't think this will do much for mature skins but for younger complexions looking to branch out and begin using an eye cream this is the perfect starting point. So what does The Body Shop Vitamin E Eye Cream contain? Vitamin E (of course) which is an antioxidant that will help to protect and repair the skin.To ensure that the formulation is light but extra nourishing and moisturising in one step The Body Shop have relied on shea butter and lastly we have rose hip oil which is derived from roses and contains vitamin A, vitamin C and the essential fatty acids omega-3 and omega-6. This oil can promote healthy skin cell rejuvenation along with eradicating dark spots and is of course moisturising making it a stellar ingredient. It is hard to believe an eye cream that costs a mere £10 can do so much but it really does. As I said I wouldn't recommend it for those who want to ward off father time but everything else it gets 10/10! The Body Shop Vitamin E Eye Cream £10/15ml via The Body Shop - link. Sounds lovely, I have a vitamin e eye cream from boots and I quite like that, have you tried it? I love this post last time and I think this eye cream seems so great and I need to try this next time I see a store. I'll have to try this one out next, I am always looking for ice eye creams and I love the Body Shop Vitamin E range so will keep this on my radar! I will definitely have to check this out i love their other Vitamin E line. There face cream is amazing never felt anything so hydrating before ! Body Shop's eye creams are amazing!! Really want to try this! I almost never use an eye cream, would be great to start with an affordable one. I'm a fan of this range but haven't tried the eye cream. It's actually the one thing missing from my skincare routine. Maybe I'll give it a go and see how I get on! Ooh i've been looking for an eye cream for a while now and this one looks incredible! I really need to start using a eye cream and this one sounds good! Maybe I will give it a go and see how I get on! I am so glad you wrote about this! I have started hunting for an eye cream and I wanted one that was fuss-free and also cruelty free. I love products from the The Body Shop and will get this one the next time I am in the mall. I use retinol so my eye area gets a bit dry and do not apply anything particular for it. But then again, I will probably get just any lovely cream from this range to use on the whole face (including eye area) as I do not have sensitive eyes.